Coastal Inspiration: We love this Coastal Gadget! 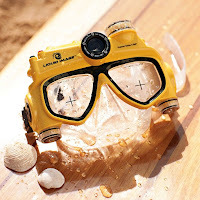 I recently purchased this Underwater Video Camera Mask from PBTeen for my other half for Father's Day. This has turned out to be one fun gadget for documenting our water adventures. Once you get the hang of it it takes pretty decent pictures and videos. It is not professional grade but still fun. Great gift for the water loving guy or gal in your life. The camera is by Liquid Image and is available from other online retailers and in other versions as well. Here are a few of our images.